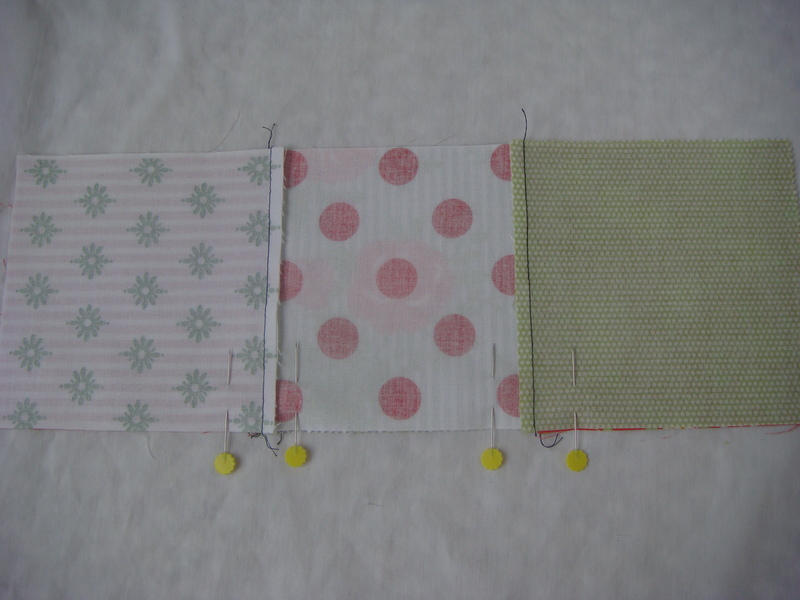 We’ve learned some basics and cut our fabric. Let’s sew, shall we? 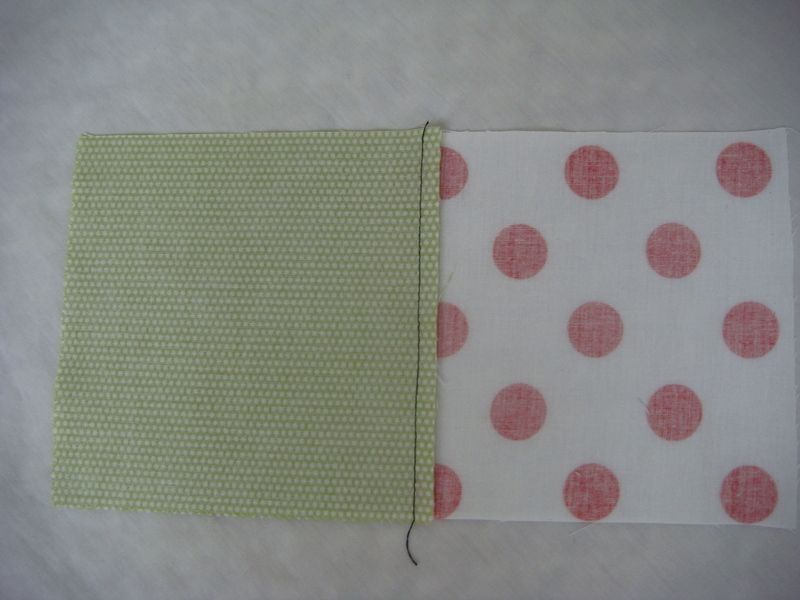 In quilting we sew with a 1/4-inch seam. Sounds simple but it can actually be a little tricky. Depending on your machine, you may want to purchase a 1/4-inch foot. The generic foot that came with my Juki sews a 1/4-inch seam if I line up my fabric at the edge of it. The generic foot that came with my old Singer sewed a 3/8-inch seam. You will not know what your machine sews until you try it. Oops. The problem is that the pattern math was done for a 1/4-inch seam. Once I realized the problem I quickly ordered a 1/4-inch foot and the rest of the quilt lines up nicely. No, I did not take the quilt apart where it was wrong. I generally believe in leaving mistakes in if they don’t ruin the quilt. I don’t mind seeing small mistakes like this one. It reminds me what I learned when I was working on that quilt. This will always be “the quilt where I learned that I needed to buy a 1/4-inch foot.” It’s still pretty though and I absolutely never lose any sleep over it. Or under it. 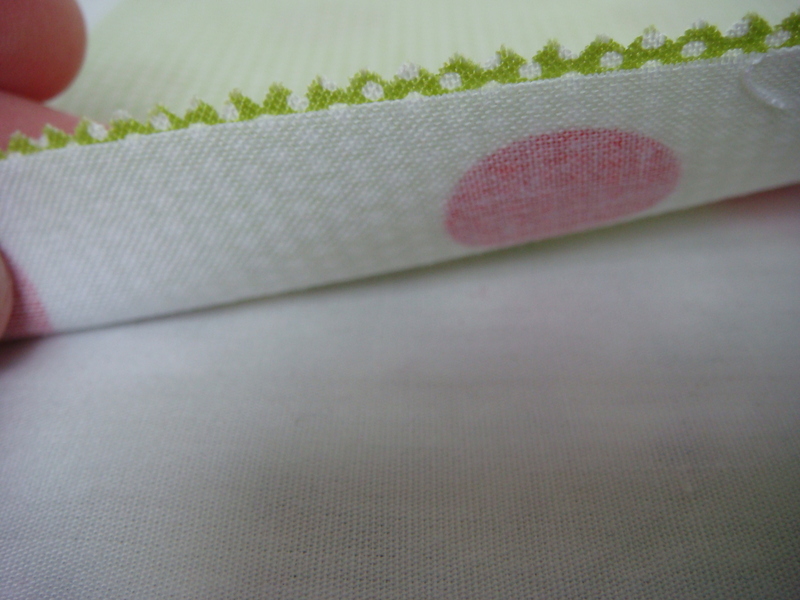 You will sometimes hear quilters talk about a “scant 1/4-inch seam” so I want to address that. 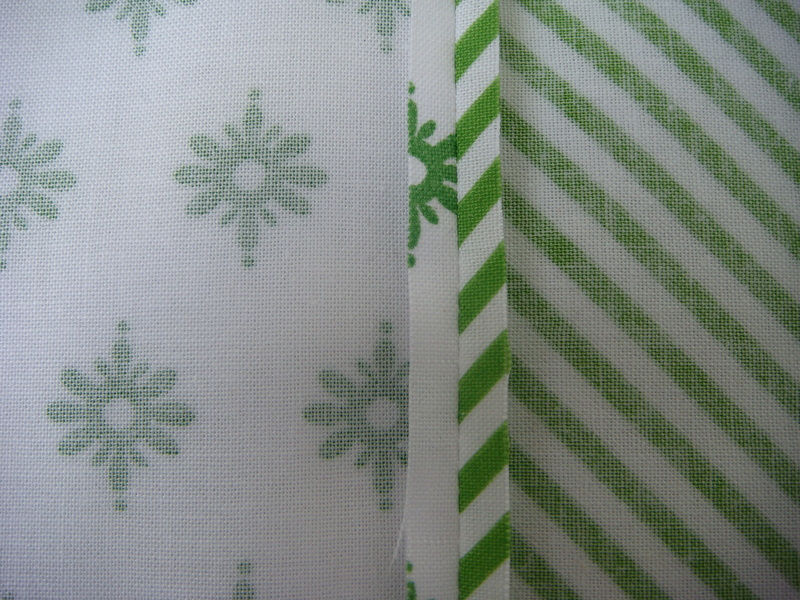 A scant 1/4-inch seam means something just less than 1/4 inch. It’s an attempt to take into account that tiny fold of fabric you lose when you sew a seam and then fold it over and press it. If you are following a pattern and finding that your blocks are turning out just a hair smaller than they are supposed to, try sewing a scant 1/4-inch seam instead of a true 1/4-inch seam. I have found this to be most necessary when I sew triangles and flying geese or any time a block has a lot of seams. You really won’t need to worry about this for this project but I wanted you to be aware of this concept for the future. 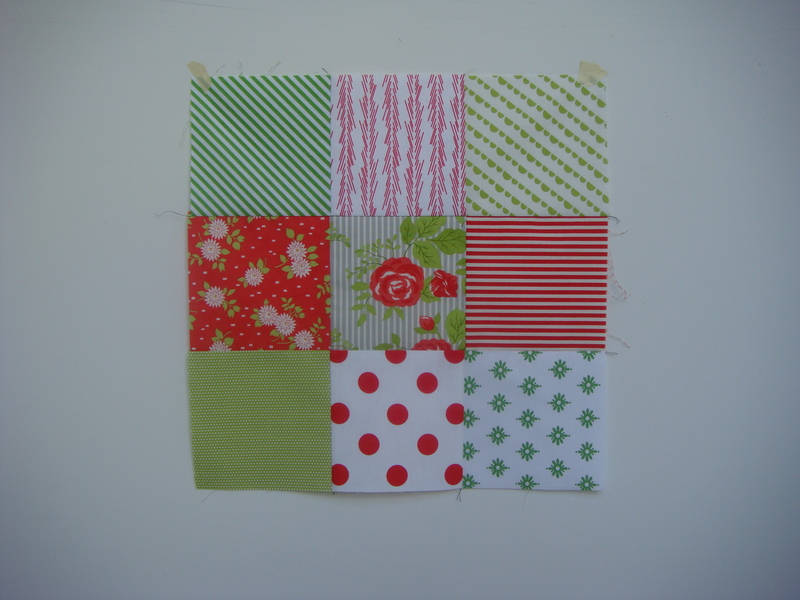 For simple square patchwork a true 1/4-inch seam is fine. Lay out your blocks in the layout of your choosing. 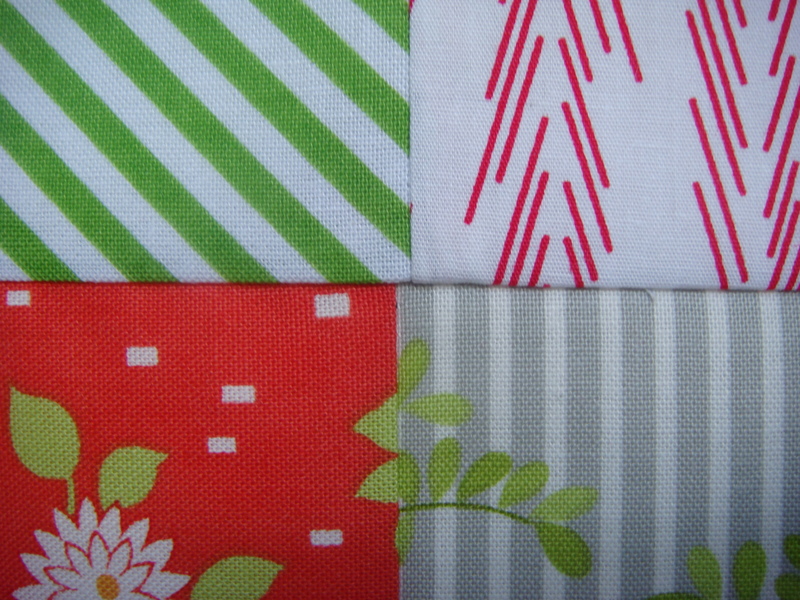 I chose to put my favorite fabric in the middle and then alternate the reds and greens. 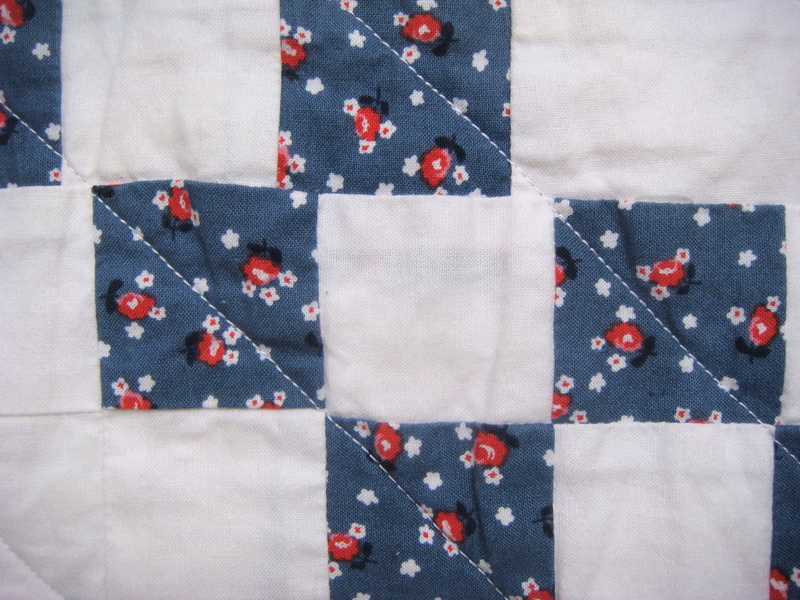 Place your squares right sides together and sew them together with a 1/4-inch seam. Don’t worry about backstitching at the beginning and end. We almost never do that in quilting because all of our seams overlap each other and then a lot of them get sewn back over in quilting. It’s just not necessary. Let’s check your seam and see how it measures. First measure it before pressing. With the ruler lined up right at the edge of the fabric, you can see my seam is just a tiny hair under 1/4 inch- just barely scant. I’m satisfied with that. You can decide for yourself whether yours is close enough. If not, think about whether your seam is too big or too small and adjust accordingly. It’s totally fine if it takes a few tries to get a good result. Just be sure that you stay consistent throughout the project. By the way, I used black thread so you could see it, but under normal circumstances I use white. The blocks as sewn should measure exactly 9 1/2 inches because the seam allowance ate a 1/4 inch from each square. If your block is bigger or smaller you have 2 options. 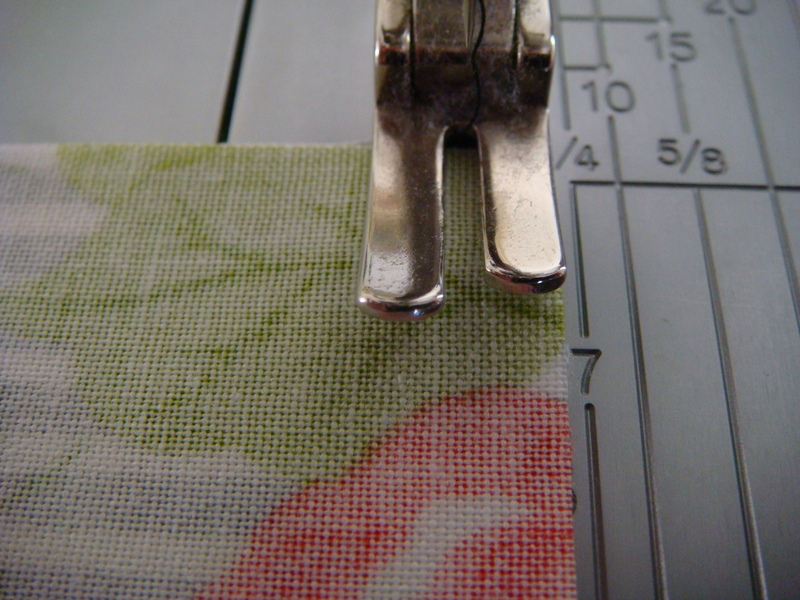 You can continue on and just be sure to be consistent with how you sew each seam. Or you can get out your handy seam ripper and work on achieving an accurate 1/4-inch seam. 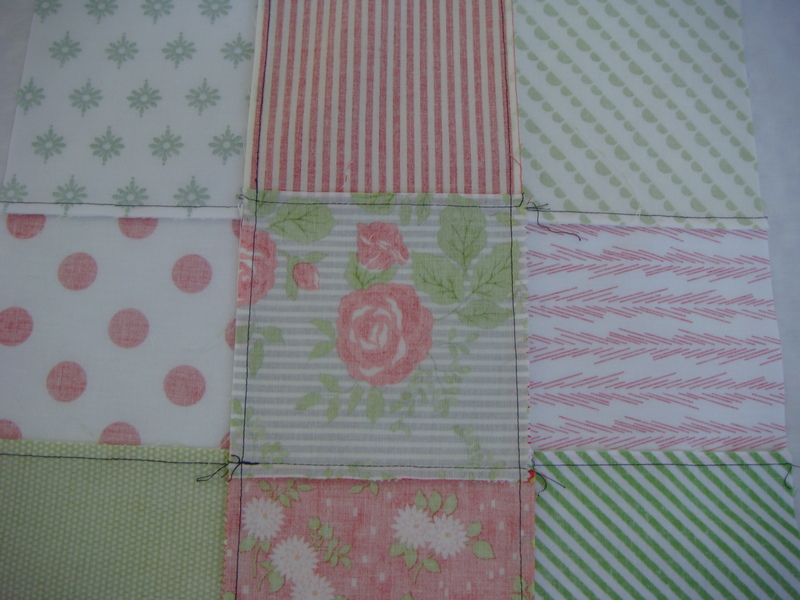 If you plan to try anything more complex than square patchwork be sure to revisit this issue! Now, let’s dive into some controversy again and talk about pressing to the side vs. pressing open. I think it’s good to understand the advantages of both methods and give them a try. Perhaps one method might be the ideal method for one project but not another. This is similar to my stance on sewing a scant 1/4-inch seam: you need to experiment a bit in order to understand different methods of doing things and when to use them. Another thing you’ll hear quilters say is “press toward the dark.” The idea is that your seam underneath will show less if you press away from the lighter fabric. 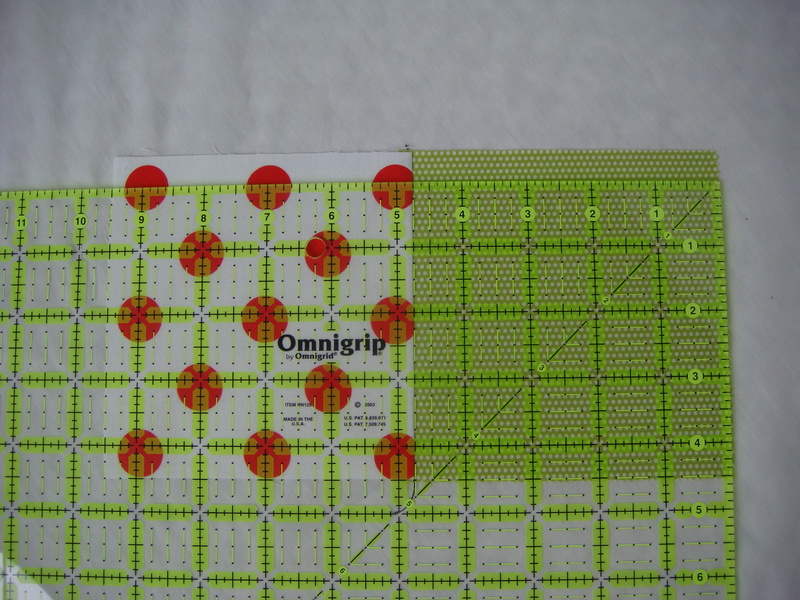 This might matter if you’re doing a really high contrast quilt (i.e. a black and white checkerboard) but most of the time it’s not worth worrying about. The important thing to remember is that your quilt does not need to be perfect to be beautiful! Try to keep it fun and just improve slowly over time. I definitely allow myself to do things incorrectly at certain times if it seems too overwhelming to tackle so many new things at once. Sewing with a 3/8-inch seam wasn’t the end of the world for a quilt or 3. But by the time I got to my 4th quilt I was ready to start working toward better accuracy. Let’s get back to sewing. So far we just have 2 blocks sewn together. Next we’ll sew the blocks into three rows. If you lay out your blocks next to your machine you can employ something quilters call “chain piecing.” This just means sewing multiple pieces in a row without cutting your thread. It’s not that important with a project this small but it can be a real time saver if you are working on a big project. 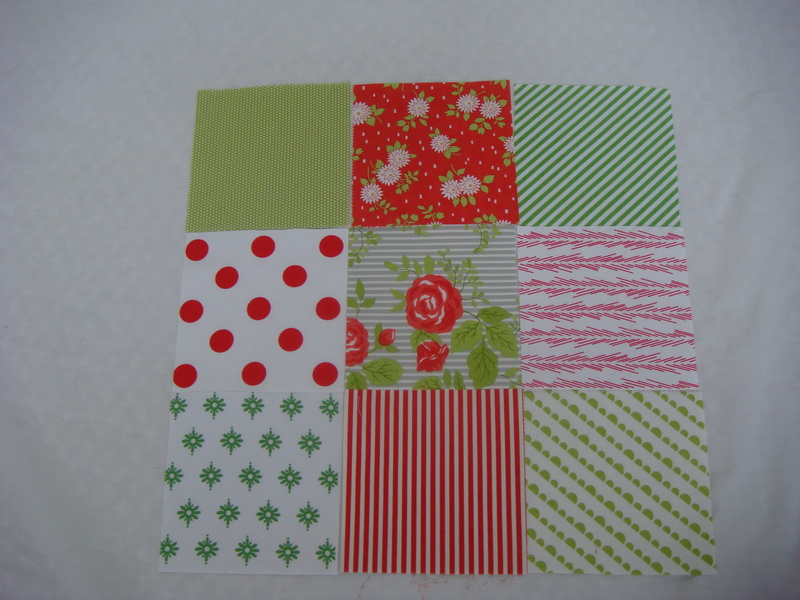 If I was going to chain piece this project I would grab the small green dot and big red polka dot and sew them together, and then grab the 2 floral fabrics and sew them together and then grab the green bias stripe and red hash marks and sew them. Then I’d take them off the machine and cut the threads. I’d do the same thing to attach the bottom three fabrics. Sew your blocks into three rows of three. Now press the seams of each row in opposite directions. I pressed my middle row seams out toward the edges and the other 2 rows I pressed toward the middle. That’s about to get important. We are going to very carefully line up these interlocking seam allowances. 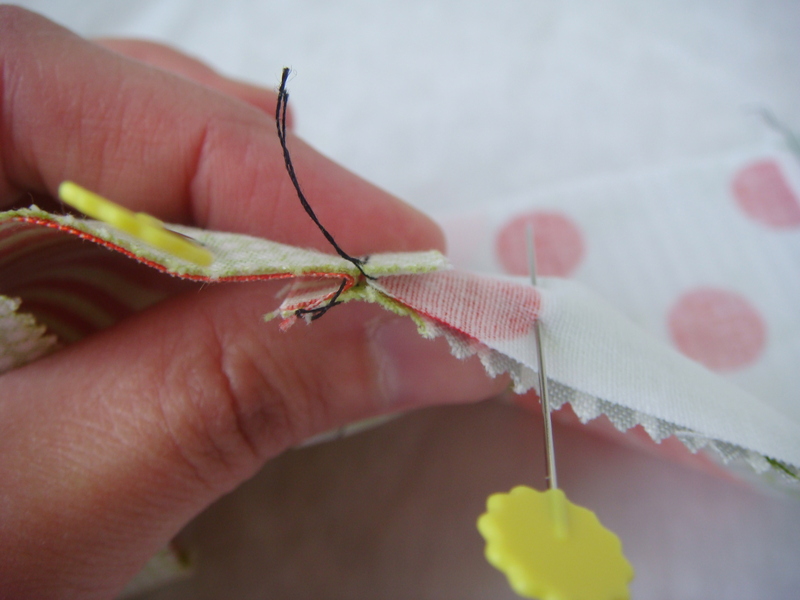 Place a pin on either side of each interlocking seam. Now sew the rows together. Press the seams in whatever direction seems natural. Ta dah! 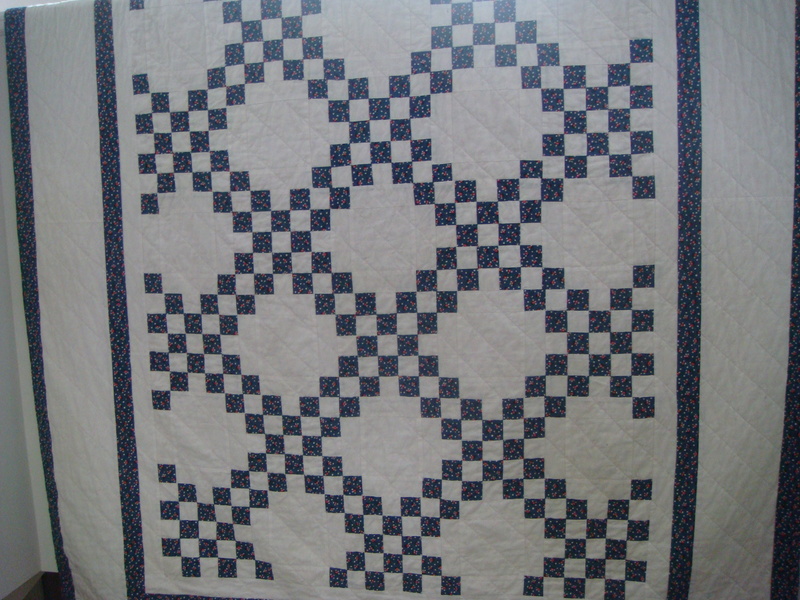 A finished quilt top. I could have fixed it and you never would have known. I chose to leave it in because #1 I think it’s a good lesson of how small imperfections can disappear in the overall picture and #2 I just didn’t really want to do it again. Every quilter has to decide which mistakes they can live with and which they can’t. Some quilters would definitely fix this. I think it’s not fun anymore if I have to sew things twice. In the next lesson we’ll prepare the quilt back and batting and baste them together. We’re getting close to finishing Your 1st quilt! 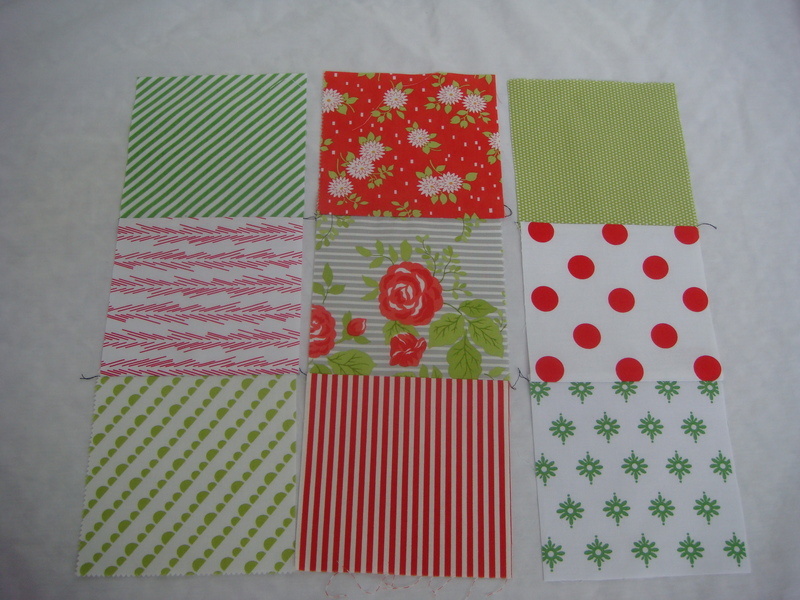 This entry was posted in Uncategorized, Your 1st quilt and tagged 1/4 inch seam, Your first quilt. Bookmark the permalink. I think it’s not fun anymore if I have to sew things twice.a-to-the-freaking-men. love it. So not fun anymore if you have to sew things twice. Or three times. 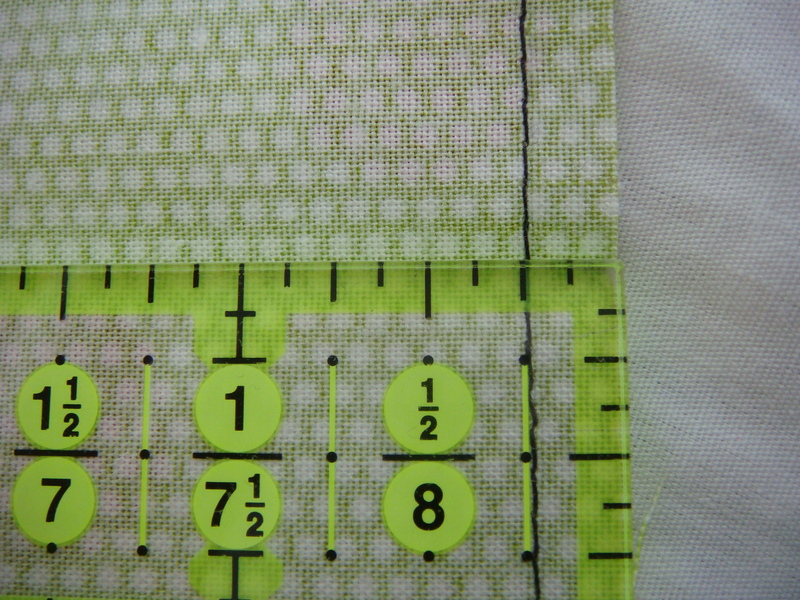 I need to be more vigilant with my 1/4 inch seam, I have read recently about ways to test it when you are first starting out, similar to how you measured the sewn blocks after pressing. I will be vigilant about this now that I’ve had to deal with the problems it causes. Good tutorial, Sarah! I’m reading them and learning from them, so thanks for taking the time to write them. Nice to know that I don’t have to backstitch each end every time. I didn’t know that! This is a really useful series. Thank you. I am getting super excited to take your class! I’m glad I’m not the only one who believes in leaving mistakes unless they compromise the quality of the quilt (i.e., it is literally going to fall apart if washed unless I fix it). I’ll unpick a badly-sewn seam, of course, but once things are together…I leave it. This series is such a great idea! I’m quietly reading along and am learning how many things I never learned to do right. (Guess what I don’t iron my fabrics before I cut, like, EVER.) (I KNOW.) Next time anyone asks me where to get started I know where to send them. I agree! I don’t think handmade items are meant to be perfect anyway. Nice tute. Very nice blog. I’m a new quilter and found this very informative and supportive! Really helpful! 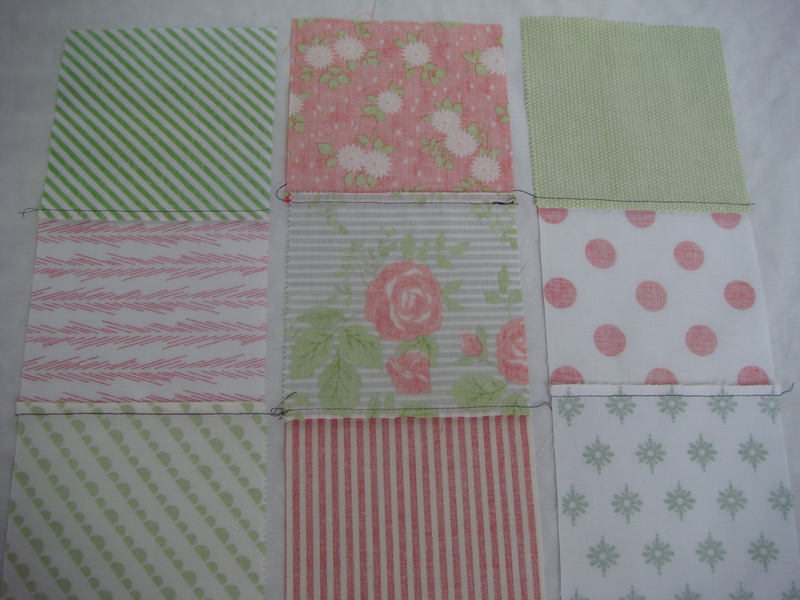 I am just starting out with quilting. Learning I need to be way more precise! Your blog is such an encouragement to keep trying. This tutorial is fantastic. I don’t have reams of patience and do not need everything to be letter perfect. I’ve learned so much from reading your blog. Thank you. loading pace is amazing. It seems that you’re doing any distinctive trick. I know this is an old post, but I wanted to let you know how helpful this tutorial has been. I’m working on my first quilt, and I’ve had your tutorial up on my computer all day, so I could stop and look at it as necessary. Thank you for your efforts! I, also, enjoyed your tutorial. You explained things perfectly and pictures were great – nice and large. I’m sewing tiny pieces together (a wrench block within a larger block) and I do not have a quarter inch between my points for the seam. I decided after reading your blog that I cannot live with it so I’m doing it over hopefully to learn where my mistake was. I have been cracking up through your tutorials! I love your attitude that learning and mistakes are part of quilting. Thank you for bringing joy to a craft that some people feel the need to perfect the fun out of. I reckon that, with a decent (and easy) shed plan, I could do a pretty good job. extending ourr homes is deciding what thpes of extension we need to take advantage of on the space of our lot area. allow you to face in either direction.